What Are the Basics of Garbage Disposal Plumbing? 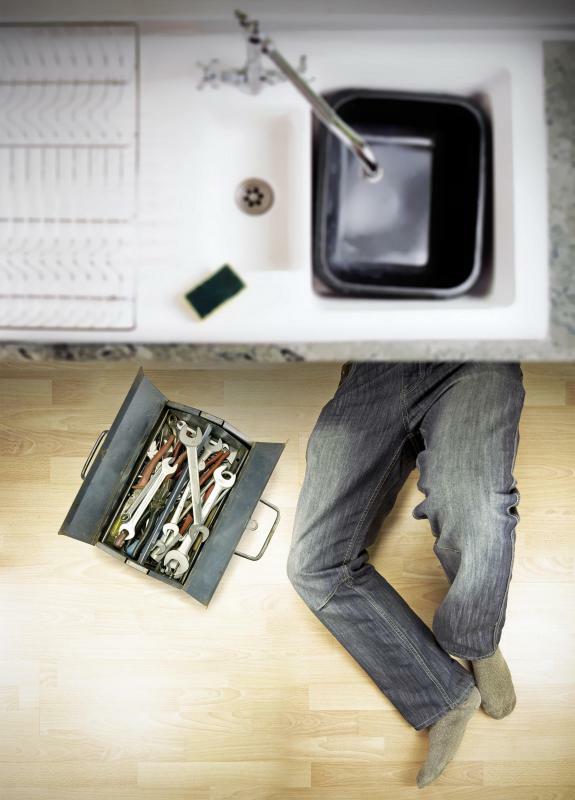 In-sink garbage disposals can become clogged. Garbage disposal plumbing needs to be set up properly so the main drain lines won't plug. There are many different types of garbage disposal units on the market, but the basics of garbage disposal plumbing is the same. The unit is attached directly to the sink, and drain lines are attached separately from the other side of the sink, if one is present, and then it is connected into the main drain pipe. Whether beginning a new installation, replacing an older model, or simply repairing the plumbing lines, once the basics are understood, the task will be accomplished in the same way no matter what the situation demands. When installing a new unit, the garbage disposal plumbing needs to be set up correctly in order for it to work properly, without causing the main drain lines to plug. The first step is to remove all of the old piping from underneath the sink and then attach the new one to the bottom drain hole in the sink, making sure that the garbage disposal drain line is facing towards the exiting point of the main drain. From the unit a downward angled pipe needs to be installed, and then a trap at the bottom of the run. After the trap, pipes will come up and attach into the main drain line, connecting to the pipe coming from the second half of the sink if there is one present. This design allows the piping from the disposal to be separate from the rest of the plumbing lines in case plugs or repairs need to be made. When replacing a garbage disposal, the first step will be to remove the existing drain pipes and then taking it off the bottom of the sink. The old unit is then removed and the new one is set into position. The new garbage disposal will then be sealed to the outer ring of the drain coming from the sink and the plumbing lines attached to it, replacing any parts and fittings as needed. This process is basically the same as when installing a new unit, but the garbage disposal plumbing will usually not have to be removed and replaced. Fixing a garbage disposal begins in much the same way as when replacing the unit. If the disposal has to be removed and rebuilt, then the plumbing lines will have to be disconnected from it, as well as pulling it off of the sink. If it is only leaking, then the section that is responsible for the problem can simply be replaced. 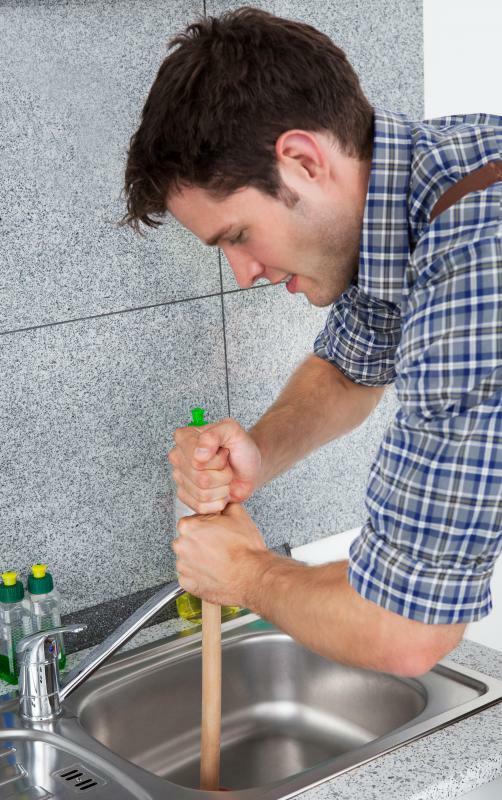 One of the most basic concepts to garbage disposal plumbing is to make sure that all connections are sealed correctly and that any cracked or broken pieces be replaced as soon as they are noticed. The basics of garbage disposal plumbing are simply a process of knowing how the drain lines work, and why separate traps are installed. In order to maximize the efficiency of the unit, while decreasing the chances of clogged pipes, the garbage disposal drain lines must be kept separated from the main drains until a trap has been installed. This allows easy access to remove clogs that the unit may cause, while preventing them from backing up the entire plumbing system. What Can I Do about a Leaky Garbage Disposal? How do I Fix a Garbage Disposal?